During my recent trip to Astana, I had the pleasure of chatting with Nurzhan Altayev, deputy Chairman of the National Chamber of Entrepreneurs of Kazakhstan (PPK), also known as Atameken, and a Nur Otan candidate for the Mazhilis. I was curious to learn what exactly the PPK does, and how it influences policy. We met on Friday at 5:30 PM. I had arrived in Astana on a redeye flight from Moscow that morning, and had two interviews prior to my meeting with Altayev. Suffice it to say, by the time I arrived at Altayev’s office, I was exhausted. But I was excited to pick his brain, as Altayev has a long career in business and working with small and medium enterprises (SMEs). 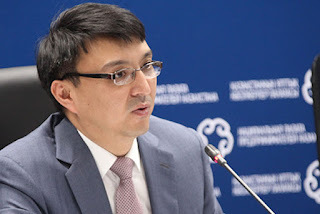 Between 2013 and 2014, Altayev served as PPK director for South Kazakhstan Oblast (SKO) and since April 2014, has served as PPK Deputy Chairman. I was thrilled to discover that Altayev and I shared a common past: we both worked in Baraholka! In 1995, while a university student in Almaty, Altayev sold Korean-made khadjipori (a Georgian bread) at a bazaar in Baraholka. At one point, he also sold ice cream, but this wasn’t as lucrative as Caucasian bread products and always melted. From my experience, the trick is to sell ice cream in the winter, as the sub-zero temperatures eliminate the need for a freezer. That’s why you see all the babushkas selling syroki (a frozen condensed milk dessert bar) out of cardboard boxes when it is -20 degrees Celsius outside. So there we were, two former Baraholka traders, just chatting over cups of shubat (camels milk), and some kurt, an assortment of dried fruits and zhent (a traditional Kazakh grain-based sweet), in honor of the Nauruz spring holiday. Our discussion began with an overview of the PPK’s objectives. The PPK is a professional organization that represents Kazakhstan’s entire business community, as all registered entities in the country are automatically a member of Atameken. Granted, not all members are active. In addition to lobbying activities, the PPK educates members on modifications in business-related legislation, which has become increasingly important following Kazakhstan’s accession to World Trade Organization (WTO) and the launch of the Eurasian Economic Union (EEC). Atameken’s three primary policy objectives include: improving access to financing for small businesses, removing administrative barriers and promoting financial literacy and business knowledge among members. Starting with the third point, Atameken recognizes that most entrepreneurs have an insufficient understanding of the range of financial products and financing mechanisms available to them. There is also a dearth of knowledge with respect to business development and marketing. Through “TsOPs”, a Russian acronym for the Center for Servicing Entrepreneurs, the PPK offers informational resources, counseling and workshops for entrepreneurs throughout the country. There is one TsOP in each of Kazakhstan’s fourteen oblasts, plus the cities of Astana and Almaty. To the first objective, in light of the financial distress that has recently affected Kazakhstan’s banking system, and the still-burgeoning credit market in the country, the PPK helps entrepreneurs who are not eligible for conventional bank loans secure financing. The PPK works with microcredit organizations and is trying to foster a culture of “angel investors” and fundraising, like on Indiegogo, so that entrepreneurs can have the financial freedom to take risks without being constrained by banks. To the second point, the PPK works with the Mazhilis to simplify administrative processes and licensing procedures. The PPK is proud that Kazakhstan’s ranking in the World Bank’s “Ease of Doing Business” has increased in recent years, reaching the 53rd spot in 2015, and the 41st in 2016. Kazakhstan’s score on the World Bank’s Distance to Frontier (DTF) metric has also grown, from 57.06 in 2010 to 72.68 in 2016 (higher number = better score). The creation of an e-government platform has helped to eliminate the middleman bureaucracy, and other measures taken to simplify registrations and permit collection have reduced the number of offices one has to visit when establishing a business. Altayev attributes these successes, in part, to efforts made by the PPK in collaboration with the government. But there is still much room for improvement. Given my previous research experiences working with SMEs in Baraholka, I was particularly interested in learning how the country’s business community is coping with low oil prices, using the downturn as a stimulus for enterprise reform. While the government for some time has been pushing SME growth in innovation and industrial sectors, the fruits of its efforts are just beginning to blossom. Over the past few years, several made-in-Kazakhstan brands appeared, including the men suits manufacturers, Ultaria and Glasman. There is a new “made in Kazakhstan” store in Astana. Apparently in SKO, there is also a burgeoning cotton sector in SKO, as cotton growers and entrepreneurs are learning how to develop spinoff industries and generate maximum marginal benefit from one commodity. “It is not just about growing cotton, but also spinning the cotton into various types of yarn, weaving the yarn into fabrics for clothing and household items, coloring the fabrics and then making final goods,” Altayev notes. But even Kazakhstan's nascent industries have their risks. As a commodity, cotton is not immune to fluctuations in global prices. Cotton cultivation is a very water-intensive crop, and water usage, and the potential for a severe water shortage, is an ongoing discussion in the region. Plus, Kazakhstan will have to compete with its southern neighbor, Uzbekistan, which has achieved scale in cotton production and has a long-established history of textile production. Still, it is encouraging to see that the PPK, and others, are taking the steps to diversify Kazakhstan’s economy. Not an easy job. While the government supports import-substitution policies that will strengthen Kazakhstani enterprise, there are additional proposals for the government to endorse “Made in Kazakhstan” enterprises on a permanent basis through the provision of subsidies to certain enterprises, following the Turkish model. Apparently, all Turkish textile manufacturers receive a government subsidy for their retail outlets in Turkey and overseas. Perhaps the government of Kazakhstan should adopt similar measures to foster indigenous textile production. Though, when appropriate, the government has taken various measures to protect indigenous Kazakhstani enterprise over the past year. To illustrate, traditionally, a glass-bottle manufacturer in SKO used to provide most bottling companies in the region. But over the summer of 2015, when the Russian ruble experienced a steady depreciation, and before the Central Bank of Kazakhstan took the move to free-float the tenge in August, there was a period when currency effects rendered it more economical for Kazakhstani enterprises to source bottles from Russian manufacturers, rather than their traditional, local Kazakhstani supplier. SKO bottle makers began to suffer and the PPK lobbied Astana on their behalf. The PPK ultimately succeeded in securing government support, in the form of tax concessions, for “made in Kazakhstan” enterprises, and those firms that use domestically-produced components. This anecdote reminds me of my experience in April 2015, touring the Astana Economic Zone. At one train-car factory, our guide explained that the firm imports steel from Russia. While Kazakhstan produces steel, at the time, it did not produce the specific type of steel required for train-car production, and because under EEU customs regulations, Russian steel is imported treated the same as steel produced in Kazakhstan. Devoid of the protection of an import tariff, in certain industries, it can be difficult for Kazakhstani producers to compete with their established Russian counterparts. The economic turbulence of 2015 – caused largely by the downturn in oil prices and its effect on government budgets, as well as the move to float the tenge in August – demonstrated that strengthening the competitiveness of domestic enterprises must be a top priority. The dilemma facing Kazakhstani producers in this respect is not unique to Kazakhstan – that is capitalism in a globalized world. In a free-market economy devoid of barriers to the uninhibited movement of goods, services and moneys across national borders, enterprises will have to compete for market share. While this competition will lead to short-term losses, especially for new-entrants, over the long term, Kazakhstan’s enterprises can succeed so long as they continue to focus on efficiency improvements through the use of technology and strengthening of human capital, Altayev asserts. In addition to efforts to promote domestic enterprises, the PPK is also advancing legislative projects for the development of Kazakhstan’s economy. One such project includes the requirement that all retail outlets (including bazaars) use a POS terminal for credit cards. This is a very, very controversial theme, as the proposal to require POS terminal usage was first introduced a few years ago, and its implementation has repeatedly been delayed due to the insufficient infrastructure at bazaars. However, the PPK is optimistic that POS terminals will become more accepted, as already the use of debit cards is widespread throughout the country. Using POS terminals will help track transactions, promote transparency and a more orderly set of accounting practices by small businesses. “In many ways, this is a natural evolution,” Altayev adds. The challenge with POS terminals, from my experience in the bazaars, is implementation. Ensuring that all traders, regardless of their immigration status, have a functional terminal. Oftentimes traders would share machines for receipts. It is also essential that measures be taken to educate traders, particularly migrants, on how to use a POS terminal and credit instruments. Finally, all bazaars should also be hooked up to a reliable power supply and have internet access. There were times in the bazaar when the power went out. It is important that there is a basic physical and institutional infrastructure in place to support the widespread use of POS terminals. We ended up chatting for over two hours – I didn’t return to my hotel until 8 PM. I’ve met a lot of officials in Kazakhstan, and it was truly a pleasure to have an open conversation with someone who is embedded in the weeds, and well versed in the nuances, of SME reform in Kazakhstan. My major takeaway from the meeting is that there is an understanding amongst business and political leaders of the need for reforms to the business environment, and measures are being taken to foster SME development. But it is still early, and they need time. Thanks Altayev for the insightful interview, and thanks readers for following along!